Originally published in VICE Magazine, February 25, 2016. Peering through the slowly fading fog, I disembarked from the ferry. Behind me lay the Canadian shore of Newfoundland. Ahead, I could make out France’s tricolour blustering furiously in the wind above a sleepy port. I’d arrived in Saint-Pierre and Miquelon, the last bastion of France’s once vast North American empire. As I stepped through immigration, I couldn’t believe I really was technically in France, without ever having left North America. It was an attractive prospect: a European vacation without the long-haul flight and cost. Originally claimed by France in 1536, these three islands have traditionally been dominated by cod fishing. There was also a scandalous interlude of rum smuggling during the heady days of American Prohibition, when savvy locals used the islands as a base to hoard and secretly transport alcohol to thirsty Americans on the mainland. More sinisterly, Saint-Pierre is the site of the only use of a guillotine in North America, back in 1889, to do away with a murderer. You can see the offending axe in the L’Arche Museum, but as an admirer of French culture and cuisine, I’d come for my stomach. What would a slice of France that has developed separately from the mainland for centuries in North America look like? Would there be a big difference, and could I taste it? Lying in the North Atlantic Ocean to the south of Canada, Saint-Pierre and Miquelon’s proximity to the icy currents driving down from the Arctic, mixing with the warmer waters from the gulf, results in fog. A hell of a lot of fog. So much so that the 6,000 French locals have resorted to painting their houses in an array of bright colours. From canary yellows and ruddy scarlet to eggshell blue, the primary hues punch through the eddies of thick whiteness that often hovers over the islands. “We say here that summer only last two months,” my host Laure acknowledged sardonically. Now in winter, there’s also snow to contend with. But don’t let that deter you. The islanders, mostly descended from Brittany and Normandy in Northern France, as well as the French Basque Country, certainly don’t. There is skiing and snowmobiling, the remnants of nearly 500 shipwrecks, and a ghost town on Miquelon, as well as dolphins and whales to spot. And for those of you who enjoy your food, these diminutive, largely unknown islands have even more to offer. 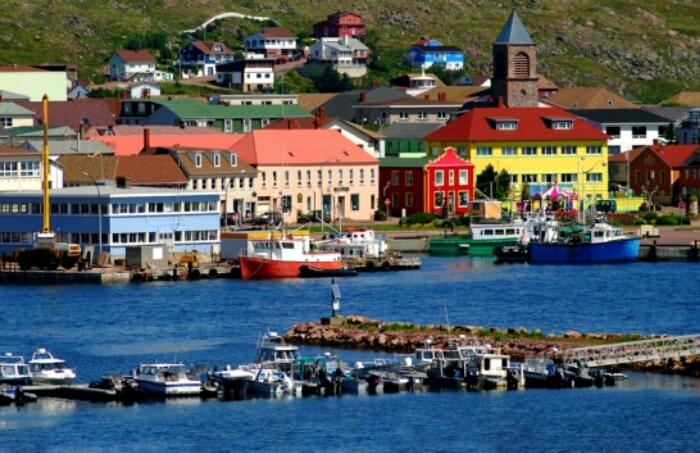 The waters surrounding Saint-Pierre and Miquelon are rich resources of seafood. Sadly, overfishing means the fishing industry is no longer what it was in its heyday. Fortunately, the sea is still an integral part of Saint-Pierre’s day-to-day existence. “Fishing is a big part of the island’s life. There are a lot international fishermen who come to Saint-Pierre, most of the time to have fun and party. Multiples nationalities meet: Japanese, Korean, Spanish, Faroe Islanders…” Laure recounts. It was local Miquelon scallops in particular that I was after. “When French President Hollande visited here last, he was served Miquelon scallops,” Ludo, Laure’s partner, explained proudly. Luckily for me, I was to be accorded the same honour. I was happy to accept, as I love the delicate taste and meaty texture of scallops. Normally, I’m used to them being cooked with salty bacon in an unctuous buttery sauce, or poached in cream. In keeping with the colder climes I found myself in, the star ingredient of Ludo’s sauce was a liqueur made from a fruit, locally called plate-bière. 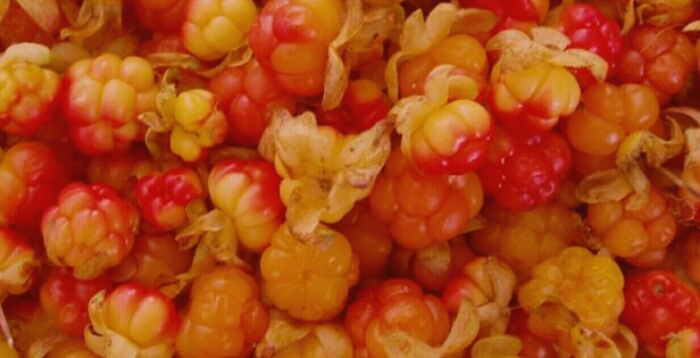 It’s a red- to salmon-coloured berry that also grows in other northern regions of the world—in Alaska, Scandinavia, and Scotland. Its high vitamin c content makes it popular with North American Inuits as a guard against scurvy. (No lemons in that part of the world!) Able to withstand temperatures of -40 degrees Celsius, it’s known in English as bakeapple or cloudberry. Yet, despite thriving across large tracts of the globe, it’s hardly a French or an American staple. In Saint-Pierre, you can find it everywhere, often incorporated into traditional recipes. Eaten raw, the taste is a little too tart, I was told. Instead, in little French cafés on the sea front, tourists can spread plate-bière jam onto croissants as they shelter from the icy wind, or drink it in bars in the form of cider, as well as savour it in cakes bought from the local supermarket. Plate-bière is also popularly fermented into a sweet liqueur on the island. Rummaging in a kitchen cupboard, Ludo pulled out a bottle and held it up for inspection. The translucent liquid was amber–coloured and looked thicker than I expected. Taking the generous shot glass handed to me, I smelled a vaguely floral scent. It’s hard to describe the flavour: sweet but with a slightly bitter aftertaste. With my aperitif sorted, I watched as Ludo placed the Miquelon scallops in a gently simmering mixture of seasoned cream and a little butter. So far, so French. He then poured in a few swigs of the plate-bière liqueur. Minutes passed as the sauce thickened and the scallops glistened. White rice accompanied the dish, with the tangy crispness of sliced green chives scattered over the top. It was a fantastic meal, both familiarly French and memorably different, due to the sweetness of the liqueur lingering in the midst of the rich cream. Even the prequel to dinner was beautiful. Just before we tucked in, the heavens finally decided to clear, and we were treated to a gorgeous sunset over the hillside below Laure’s window. Pops of colour from Saint-Pierre’s painted homes burnished gold as we sat together to share our meal. “The brightness is beautiful here and the sunsets and sunrises are amazing.” Laure smiled. As is often the case with food, an experience of a new place’s cuisine can be such an emotional indicator of how you feel about that destination as a whole. For this trip, the impact was even stronger than usual. After all, I had so little to go on before I arrived. I’d never heard of a modern French America. Neither had any of my friends. I found Saint-Pierre to be a unique combination of continental Europe and North Atlantic America. Barely an hour’s ferry ride from Canada, you can still pay with US or Canadian dollars, and English is widely spoken. Yet its Gallic origin can be clearly seen in the fact that the only products exempt from being on the expensive side (due to being so reliant on imports) are French wine and cigarettes. Bien sûr! In fact, once a month a container ship from mainland France makes the 2,373–mile trip to Saint Pierre laden with French cheeses, wine, and pastries. It seems no matter how far away, or how much time has passed, everyone misses a taste of where they came from.